The current season has been one of massive disappointment for Arsenal fans, with the campaign fizzling out in a depressingly limp fashion. Our majority shareholder, Stan Kroenke, showing he's purely motivated by cash when he went on record to say he doesn't care if Arsenal are not challenging for honours. A complacent Board with absolutely no football experience, focusing purely on Arsenal as a profit-generating entity, not a football club. A Board happy with Kroenke milking millions of pounds out of the club every year, and refusing to give valid details of what the payments relate to. Being sold the vision of moving stadium to compete with Europe's elite, but (apart from revenue and profit) we're now probably further away from the big clubs in Europe than we were before moving stadium. A huge amount of cash sitting in the bank and comments from Ivan Gazidis that we can buy pretty much anybody, yet the money remains banked and our squad remains lacking in key areas, year after year. A manager who seems to be past his best, refusing to adapt to the modern game and dragging us down through lack of signings, poor tactics, predicatable (and often very poor) performances, and not being able to get the best from his team. Consistent failure to challenge for football's big prizes and using 4th place finishes as a cause for celebration, when all Champions League football means is more income for the Board to celebrate. Basically speaking, Arsenal Football Club has gone stale. We are seeing the same failures year after year, and amid rumours that Arsene Wenger may be given a new three-year contract there really seems to be no light at the end of the tunnel. Kroenke and the Board are seemingly content with Champions League cash, so outside of finishing 4th best in the league there is no pressure at all on the manager. This isn't good enough. Whether it's the manager, whether Stan Kroenke has to go and whether the Board needs shaking up and reminding that we're a FOOTBALL club, change is needed at Arsenal, A fresh approach to bring some excitement back to this great club of ours. We host Norwich this coming Saturday in what's become a pretty meaningless end of season kick about. At this game we would like as many fans as possible to show their desire for change at Arsenal by holding up signs demanding that action is taken. We've seen Coventry City do this successfully at Emirates already, and abroad there has been massive success with this approach. 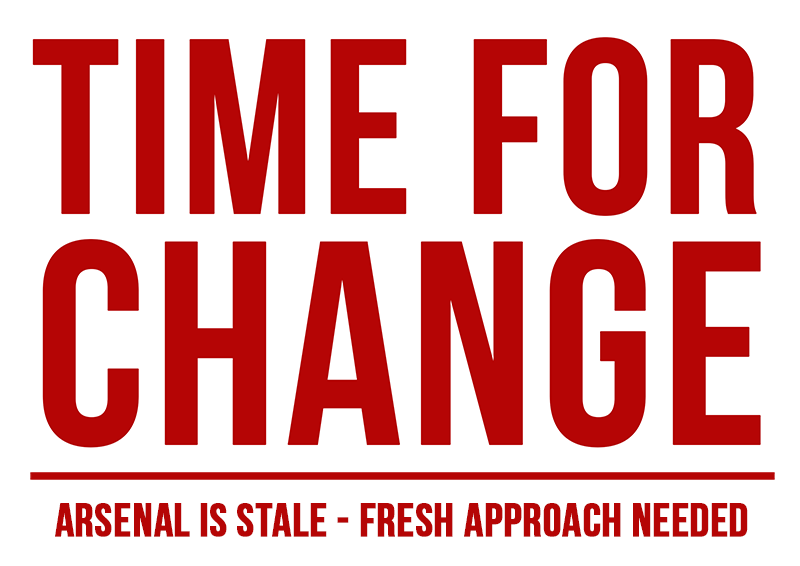 Below is an image preview of a sign declaring TIME FOR CHANGE at Arsenal. Click on it to download a copy; then print it off and if you can, print as many copies as possible and hand out to people you know are going to the game. We'll also try to get copies in pubs around the ground and handed out near the stadium on the day. We ask that all fans hold these signs aloft on 12 minutes, and 78 minutes (12 minutes from the end of the match). Then at the final whistle hold them up again. We'd love to see a consistent effort in highlighting this message and hope people join in. There have been huge numbers of people saying it's time to protest, so now is your chance. REDaction are alongside us with this protest, and we expect more groups to follow and show their support. See REDaction's announcement by clicking here.